The Chinese are coming. Really! The Americans and the Europeans are bracing themselves for the onslaught of cars which are going to be coming from China. Auto News reports that although most automakers in China are small, and currently their vehicles cannot meet US and European safety and emission standards, they are backed by ambitious provincial governments with deep pockets. Right now, the world’s manufacturers are either fooling themselves by burying their heads in the sand, or madly trying to forge partnerships with the Chinese. Ford Motor Co. chairman Bill Ford said to reporters in Beijing a few weeks ago, “It is easy to build a car; it is harder to build a brand.” I honestly feel Bill Ford might regret that remark one day. It is only a few years ago that the world had never heard of Kia, Daiwoo and Hyundai. They are all now household brands. Here are next ones, thanks to China Inc. The top contenders include Chery Automobile Co.: Industry rumors to the contrary, Chery still aims to export to the United States. But it has slowed its U.S. export plans so it can produce higher-quality vehicles. Meanwhile, state-owned Chery will boost exports to developing markets such as Iran, Egypt, Indonesia and Russia. Chery is based in the city of Wuhu in the central China province of Anhui. 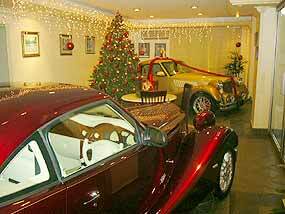 In 2005, it sold 189,158 light vehicles, the most of any domestic Chinese automaker. Chery will start exporting vehicles to the United States and Europe, most likely in 2009 or 2010. Chery will export 50,000 cars this year out of a total production of 300,000 units. A Chery executive said the original plan to begin exports to the United States in 2007 was “not practical.” He said, “It’s our dream to sell vehicles in the U.S. and Europe.” Chery’s plan is to export its own brand of cars to the United States and Europe and is separate from negotiations with DaimlerChrysler about building a small car for export, Chery managers and industry sources said. The next is the Geely Automobile Holdings Group: In January, Geely founder Li Shufu predicted his company would export cars to the United States in 2008. Geely is designing and building a car just for export to Western countries, working with Magna Steyr AG, a design and engineering company owned by Magna International, of Toronto. 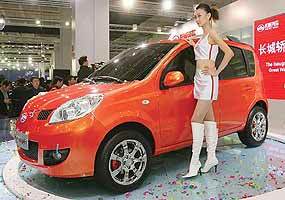 In 2005, Geely sold 148,182 units. The Great Wall Motor Co.: Great Wall has started exporting to Europe. In September, about 500 Hover small vans arrived in Italy. Great Wall will export Hovers and pickups to nine European countries by the second half of 2007. In 2005, it sold 29,027 units. Brilliance China Automotive Holdings: Brilliance partners with BMW AG in China. It has been trying to export a version of its own Italian-designed, full-sized sedan to Europe. Sales at Brilliance’s venture with BMW, which assembles 3- and 5-series sedans in China, more than doubled in 2005, to 17,582 units, according to Automotive Resources Asia, a Shanghai consulting firm. Nanjing Automobile Group: In Oklahoma and England, commercial truckmaker Nanjing Automobile Group aims to assemble cars based on technology it purchased from the MG Rover Group. Nanjing also makes cars and vans in joint ventures with Fiat. The company says production of the MG TF Coupe in Longbridge, the site of the former MG Rover plant in England, is scheduled to begin in 2007. U.S. production of the MG TF Coupe is scheduled for 2008. Nanjing Auto suppliers say the TF will be assembled from kits shipped from China. Changfeng Group: As the only Chinese automaker to book space so far at the Detroit auto show in January, Changfeng is an unlikely exporter. In 2005, this state-owned company sold only 24,170 units. But Changfeng, which is based in Changsha, the capital city of Hunan province, has strong support from its local government. That includes cheap loans. SAIC Motor Corp.: SAIC Motor plans to build its brand in China before it exports. But suppliers say SAIC Motor, which is owned by Shanghai’s municipal government, may have the best long-term prospects in the West. Europe is the first export target, because SAIC Motor models are based on technology purchased from MG Rover. Last year, SAIC Motor’s partnerships with General Motors and Volkswagen produced 870,000 vehicles. The company has learned much from its partners. We will all be driving a Chinese vehicle by 2016. Mark my words. I am a great believer in age, experience and animal cunning. Those three attributes got me through all my races after the time I turned 50. It’s why older race drivers can still perform on the track. They’re probably not as ultimately fast as they were as bushy-tailed youngsters, but they have the experience to stay out of trouble, to be able to see tell-tale oil slicks on the surface of the track, and see where other drivers are driving above their heads and sit back, as you know they won’t make it to the chequered flag. The upcoming Four Hour race at Bira on January 7 will see a great mix of youth and enthusiasm, and the aforementioned age and experience (and animal cunning). The Pizza Company Racing Team’s second car is certainly one to follow the age and experience route, with three of their drivers able to boast 179 years of experience (but not all of it racing) between them. 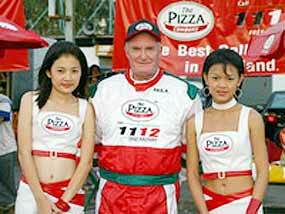 The three are the Pizza Company owner, the very well known Bill Heinecke, regular Pizza Company race team driver Paul Kenny and Dr. Iain of the Pattaya Mail’s Automania page. Bill began racing as an 18 year old and has been racing in the Porsche Cup Asia for a few seasons, Paul is a former Thailand Go-Kart champion and has raced in many categories and Dr. Iain is a former Australian champion in Sports Sedans, Formula Ford Hill Climb and Gemini one make races, so they have all racked up plenty of racing miles as well. The three intend to enjoy themselves and still be there at the end of the day. “To finish first, first you have to finish,” is a well known motor racing saying, which they understand very well. More about the Four Hour and the Pizza Company Racing Team as we get closer to the race day. Last week was an easy one. I asked which five cylinder diesel engined experimental record breaking car was originally built with a four chamber Wankel style rotary engine? It was the Mercedes C111. So to this week. This luxury two-door sports coupe features a carbon fibre/kevlar body, stainless steel for all metal components, and the latest in safety technology. It is mid-engined, up to a supercharged 370 bhp output. Its first service is scheduled for 100,000 km and it has a three year unlimited distance warranty. What is it? Are Jaguar and Land Rover for sale? Break out your chequebooks, there is an opportunity to buy both Jaguar and Land Rover marques, while Ford is undergoing “restructuring”, to use a loose turn of phrase. With the financial statement of FoMoCo being a blaze of scarlet, Ford has been looking to see where they can raise some finances. Initially the sum of USD 17 billion was needed, but within a week they were talking USD 22 billion. To cover this, they were mortgaging everything from Henry Ford’s original model T to 10 of its 33 U.S. plants as collateral. It doesn’t make sense to mortgage a plant that might close or go on the auction block, insiders say, which means that there’s 23 of them on shaky ground. Financial analysts have noted that Volvo assets were fully pledged as collateral too, signaling that Ford is likely to keep it. However, Jaguar and Land Rover have not gone into the mortgage basket, so they are unencumbered and potential assets that can be sold. The only Land Rover asset pledged is its North American distribution center. As I have always said, if you want to read about the real situation in the automotive world, then do not miss your paper’s financial pages. They always make for interesting reading and even more juicy speculation. There are certainly some naïve people around, even in the dog eat dog world of Formula 1. There we have the World Champion Alonso (Renault) who announced at the beginning of 2006 that he was defecting to McLaren for 2007. Renault was not amused! Now we hear that McLaren was keen to get Alonso out on track and testing at Jerez during December and had said that they would approach Briatore to ask for the Spaniard’s early release from his contract with them which is current up till December 31, 2006. However, at the last minute, Renault relented and Alonso got to have his first try in a McLaren, though Briatore insisted that the car carry no advertising and Alonso was in a plain white helmet. Much ado about nothing, if you ask me! Automotive News in the US claim that Lexus will launch a performance brand in late 2007 to compete with Mercedes’ AMG and BMW’s M divisions. Lexus will start with an IS sedan equipped with a 425 hp, 5.0 liter V8. The sedan will be called the IS-F. It will debut at the Detroit auto show in January. The engine is a retuned version of the LS 600h L hybrid’s engine, dealer sources said. It is also expected that Lexus likely will carry the “F” nomenclature into other high-performance Lexus vehicles, a dealer said. He said a GS-F sedan and IS-F coupe likely will follow. The IS-F - “F” as in “fast” - will go on sale in December 2007 Lexus told dealers at a recent national meeting. Toyota Motor Corp. filed for a trademark for “IS-F” on November 8 with the U. Patent and Trademark Office. It also filed for a trademark for a stylized “F” logo on Oct. 9. A dealer source said Yamaha is tuning the IS-F engine’s heads for more power and Brembo will be the brake supplier. Lexus declined to comment, but you can take it that there will be a performance Lexus division as well as the luxury side. And knowing Toyota/Lexus, it will be a top challenger for AMG and the M series vehicles.